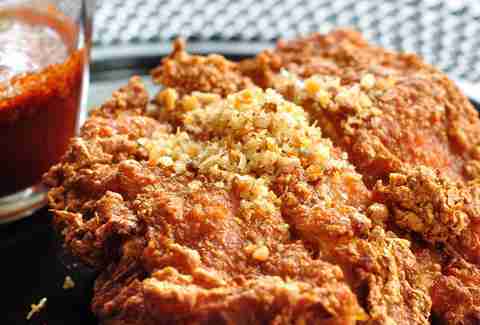 There's no shortage of great spots to get fried chicken in NYC, because if there WAS, we'd be in the middle of the Fried Chicken Riots of 2013. 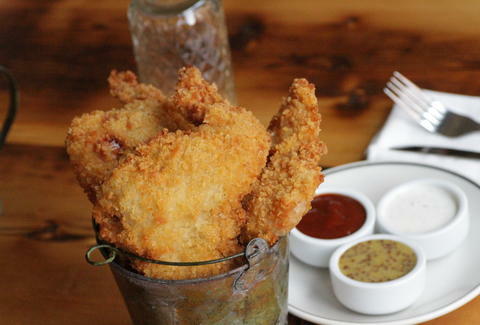 Luckily, the crispy, juicy poultry supply is as abundant as the appetite for it. Here are five delicious new ways to score it that you shouldn't miss. The anticipated reworking of the JoeDoe space as Joe & MissesDoe brings with it the Hot Dipped Chicken, a thigh lightly coated in rice flour, fried, then dipped in a spicy sauce made from a combo of sambal, Tabasco, and maple syrup. 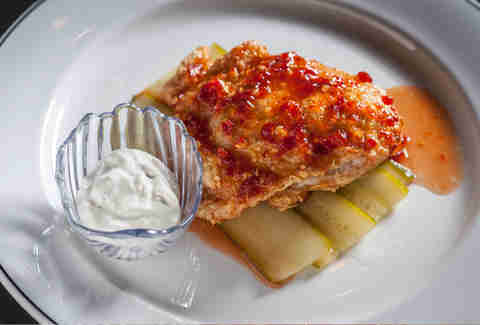 It's served with a heat-cutting garlic yogurt sauce and pickles sweeter than Tommy from Rugrats. 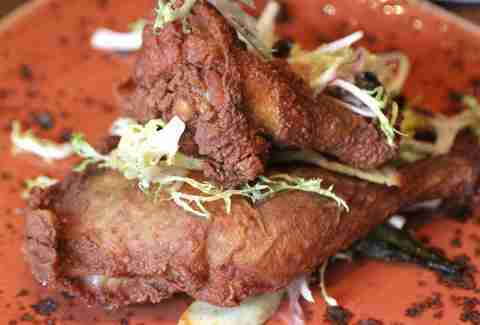 While not technically "chicken", the cinnamon-scented fried guinea hen at this Harlem hot spot (whose flavor inspirations come from the African diaspora) totally counts because it's still in the fowl family, and it smells mind-blowingly fantastic. Adding to the influx of dope new Thai spots, Somtum focuses on the Isan region, which means adding their Sa Poak Kai Tod Der to your fried chicken bucket list (hey-o!). It's marinated in garlic white pepper, coriander root, lemongrass, and red curry paste before a date with the fryer, then it's served with their special dipping sauce, a sweet-spicy concoction of chili powder, fish sauce, tamarind sauce, and palm sugar, and other stuff you aren't supposed to know about. Expect a bucket of three massive pieces that have been coated in a mixture of brown sugar, cayenne, garlic, coffee, and other spiciness overnight, then marinated in an egg-buttermilk bath and coated further with Panko and cornmeal. Oh, and then it's fried (you probably have figured that out by now). 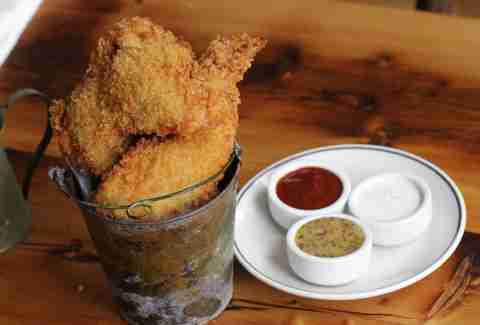 The Midwestern-influenced eatery furthers the hospitality with a trio of house-made dipping sauces: honey mustard, buttermilk ranch, and a BBQ-Buffalo hybrid. Chef Sam Hazen's new spot in the Gansevoort is turning out some serious American eats, and included is this textbook-crispy (mmm, crispy textbooks... ) fried chicken served with biscuits and ham hock gravy that almost steal the show. Also, don't sleep on the meatballs. 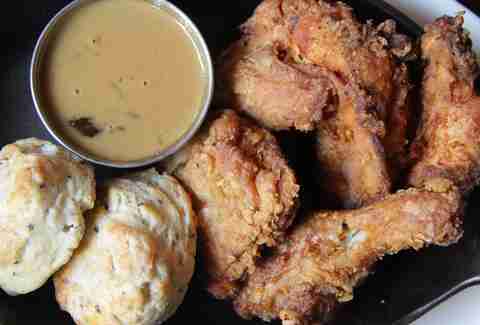 Instead, have fried chicken & meatballs and THEN sleep.